We’re on Kid Watch here- goat kid, that is. As a long-time goat keeper, here’s my go-to guide on the basic things you should do and have on hand before the does go into labor. We’re on Kid Watch here- goat kid, that is. Several of our does are bagging up and we’re hoping the rest won’t be far behind. All of our does were exposed to bucks over the summer and gestation lasts about 150 days (about five months) for standard sized breeds. We have Boer, Kikos, and Kiko crosses that we raise for meat production to sell at farmers’ markets, a couple of mutt milk goats for our own milk, plus several other types of meat animals. We leave the bucks in the pasture with the does when breeding season comes around, and since we have lots of things to tend to on the farm and we occasionally like to have day off, we’re never sure of the exact day each doe was bred. It’s not always easy to tell when a goat is pregnant, especially on double-wides like Stella, our herd queen. Stella has kidded a few times already and like most females who have had kids, she’s lost her girlish figure. But even with first-time moms, like our does Bo and Kinsey, it can be difficult to tell. Full rumens, grass bellies, and just plain being too fat can look like pregnancy. The only accurate way to know is to have a blood test done. You can have a vet come out to draw the blood and send the vials off to a lab, or you can draw the blood yourself. A quick Google search will show you were to the send the blood off to be tested in your area. We choose not to have the blood tests done since every test cuts into our profits. This does make it a little more of a guessing game when it comes to kidding time, so it’s important that we’re prepared for a slew of kids. It’s been below freezing here in our neck of the woods, and being December, we could get snow. Scratch that- if washing your car makes it rain, a doe giving birth almost guarantees snow…at night, when company is over for the holidays, and possibly while you have the flu. So, it’s best to be prepared for the worst. We generally require our goats to be resilient – they sleep outside with minimal shelter to protect them from the elements and predators, are expected to forage for the majority of their feed, and to be over-all easy-keepers, but when it comes to giving birth and to newborns, that’s different. Once the does start bagging up, all the does are brought into the barn each night. The goats are familiar with the barn because we use it throughout the year to trim their hooves, give vaccinations, and generally check their health. It’s also used when a goat needs to convalesce like Stella did recently. Having the does in the barn at night with the kidding pen ready makes it much less stressful on both goats and people alike. It’s much easier to address problems in a barn than it is under a manzanita bush or in an open pasture in the dark in inclement weather. 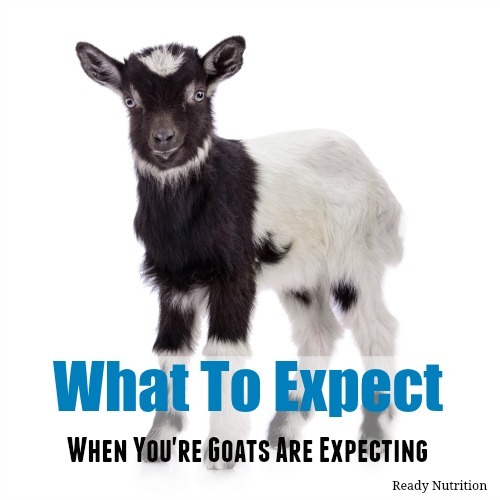 There are some basic things every goat keeper should do and have on hand about two weeks before the does go into labor. Clean the kidding pen- this is very important. Wash the walls down with bleach diluted in water, muck the floors, and lay down a thick layer of clean straw. It helps to have a couple of extra bales of straw on hand to replace any soiled straw (from manure, blood, and other nasties) that happen during kidding time. Sanitize a bucket and have it handy. We have to tote water in from the well to the barn, so we like to have several of these water containers on hand with fresh water. They have easy flow spigots that only require one hand to open/close for hand washing and the spigot can be completely unscrewed for easy filling or if we need to pour the water into a bucket. Colustrum in case your doe won’t nurse and Tractor Supply isn’t open for hours and a bottle to put it in. Since our goat barn and pasture is located some distance from the house, we also like to have several thermoses full of hot water and at least a couple full of coffee. A heat lamp is nice, too, especially in cold climates like ours, just in case a kid needs to stay warm while mom is busy giving birth to more kids. If you have a vet or good friend that is familiar with goats, keep their number handy in case things go south. During a normal kidding, the birth sack will present first- it looks like a small water balloon full of yuck. After a few more contractions, if you look closely, you should be able to see a couple of hooves and a nose in the sack. Kids “dive” out feet first and chin to the floor. The hooves and the nose open the doe up and make it easier to get the forehead out. Occasionally, a kid will present with their nose or legs turned back or even completely breech. This is when you’ll need to put on the gloves, lube them and the doe up, and very gently reach in to reposition the kid. If you’re not comfortable doing this, it’s vital that you get help. Once the hooves and head have passed beyond the forehead, the kid sort of swooshes out in a couple of big pushes. Clean the birth sack and mucus away from its nose and let the doe do the rest. Be prepared for twins. Once the doe has cleaned the kid to her satisfaction, it’s time to trim the umbilical cord to about one of two inches long, tie it off and dip it in the iodine cup all the way up to it’s belly. Let the doe love on her new baby or babies for a few minutes while you clean up and soiled straw, replace it with clean bedding, and check to make sure she has fresh, clean water available. Congratulations! You have kids! Don’t forget to take pictures of your new babies to post on Facebook. The Internet may have been built on cats, but WE know it’s all about the goats! Thanks a lot, this really is a truly awsome article! Has anyone ever wondered how to merge two PDF files online? I have, and found a simple service. I just merged 3 PDF files with an online software. I used https://goo.gl/idMerW and it's very easy to use.